Hold onto your seat. The last vacant beachfront plot in Melkbosstrand has just sold for a whopping R5.8 million. This is a record price for a vacant plot in Melkbosstrand, and the new owners paid it in cash. The plot was apparently on the market for a long time. Initially priced at R5.950.000, it was an open mandate. It has just been sold by Penny Jenkins of Complete Coast Properties. It is Penny’s personal record, too, for a vacant plot. 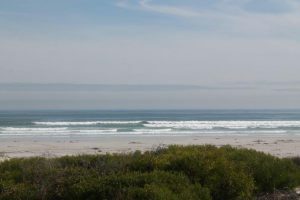 She tells Melkbos.net that two other vacant beachfront plots, also sold by her, sold for R4.5 million each. They were located next to each other, and was bought by the same person, which made that a sale of R9 million.